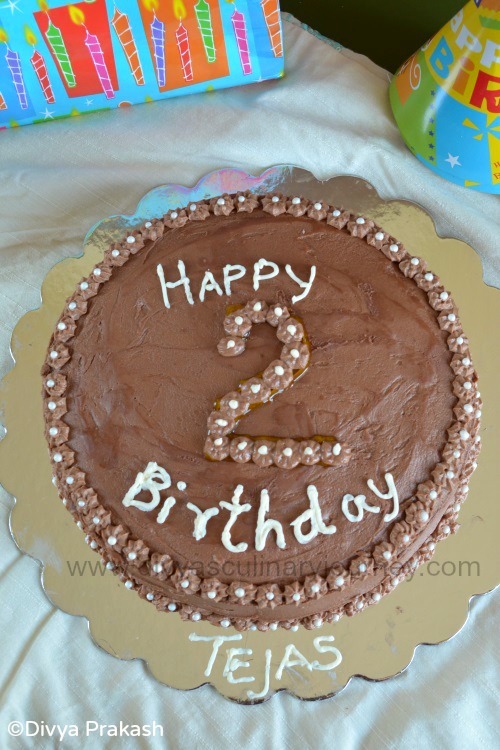 Today's recipe is Butter Cake with Chocolate Butter cream Frosting, the cake I baked for my son's second birthday. 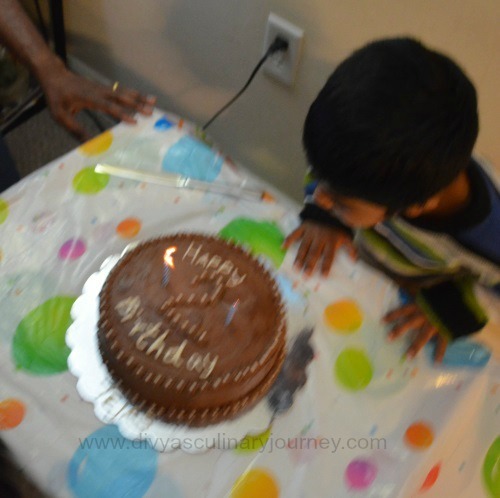 Actually my son cut 3 cakes for this birthday. Cake 1 was baked by Thaara with little help from me, though the decoration is all hers. It was cut in the midnight. Cake 2 is this cake, We cut in the evening of his birthday after coming from temple. Then Cake 3, for the Party, which we got from store. The recipe of the cake I got from Wilton site. I just halved the recipe, since I didn't want a large cake. 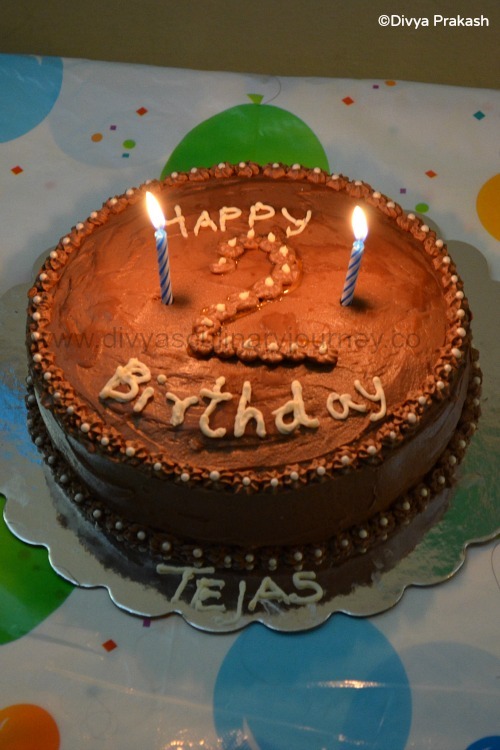 I made a 2 layered 9 inch diameter round cake, filled it with chocolate whipped cream and then covered it with chocolate butter cream frosting. Pre heat the oven to 325 F.
Prepare two 9" dia cake pans by greasing and flouring it. In a large mixing bowl, cream butter and sugar together till it is light and fluffy. Add eggs, one by one and continue to beat and add vanilla extract and almond extract and mix well. In another bowl, Sieve together all purpose flour, salt and baking powder. Add the flour mixture little by little to the butter mixture, alternating with milk and mix well to form a homogeneous mixture. Divide the batter equally in the prepared cake pans and bake for 17-20 minutes till it is done. Cool the cakes for atleast 10 minutes before removing from the pan. 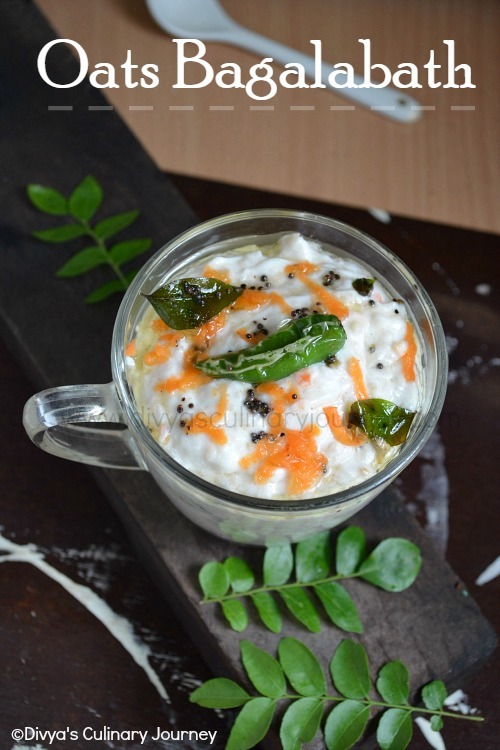 Place the mixing bowl and the whisk in the freezer for atleast 15-20 minutes. In the bowl place sugar, cocoa powder and vanilla extract, to this add 2-3 tablespoons of heavy cream to form a thick paste. Then add the rest of the heavy cream and start to beat it till it forms stiff peaks. Cover and refrigerate it till it is ready to use. In a mixing bowl beat the butter till it is smooth and creamy. Then add the cocoa powder and vanilla and continue to beat. Then gradually add sugar little by little and continue to mix and add milk and whip till the frosting is light and fluffy. Level the cakes, if required. The domes formed in the cake is sliced to give a even surface. Place one layer of cake and spread chocolate whipped cream then place the other layer of the cake. The spread the chocolate butter cream frosting on the cake till the cake is fully and evenly covered in all the sides. Then fill the piping bag with whipped cream frosting and using star tip made stars all around the cake in the bottom and also in the top. Place candy pearls on top of each star. You can use any other decoration of your choice. I used two 9 inch dia cake pans. you can also use 8 inch dia cake pans. You can double the recipe for a thicker layer. then accordingly the baking time increases. The whipped cream I prepared was right enough for the filling and the star tip decorations in the cake. You can use whipped cream for frosting the cake too. Gorgeous cakes, Thaara you rock dear, how beautifully she decorated the cake. Lucky Tejaskutty.. Butter cake with chocolate buttercream looks incredible..Looks very apt for the celebration. 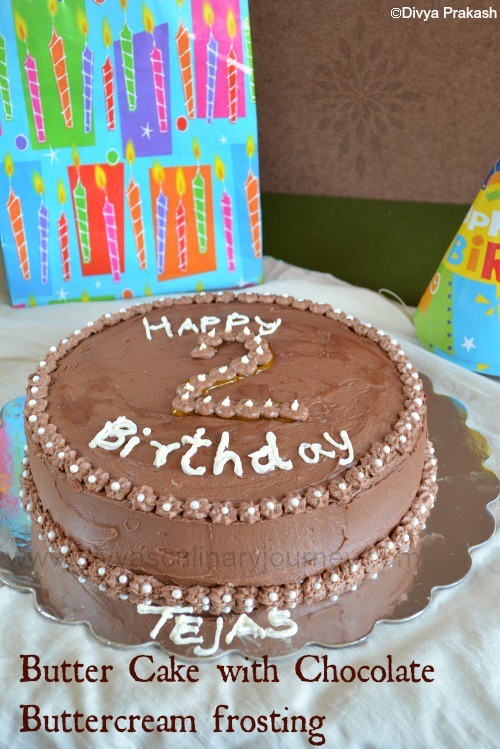 lovely cake..b'day wishes to your little one..My 2nd son's B'day was yesterday. Lovely cake divya. Birthday wishes to the young man. Wow ..... what a lovely cake! My birthday wishes to your son. Happy Birthday to your son!!! Cake look fab! Looks delicious with the buttercream frosting.. Very well done.. looks perfect ! 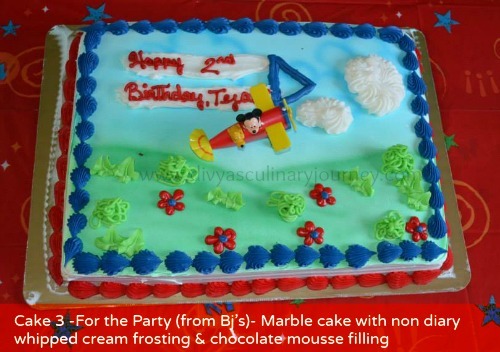 The cake looks lovely & ur son must have had a great time cutting 3 cakes. What fun! cakes looks gorgeous..belated b'day wishes to your son.. 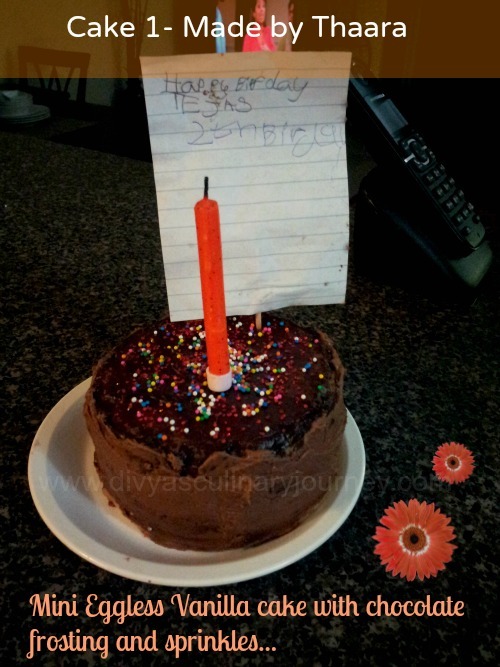 Awesome cake and convey my belated birthday wishes to your little one.